The story begins in 1993. 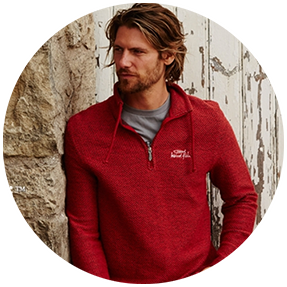 After a bracing and inspiring walk along a coast path in Cornwall, Weird Fish was born with a simple mission: to produce well priced, well made and distinctive clothes that become instant feel-good favourites. 26 years later we are proud to still have the same founding values at our core, as this is what makes us Weird Fish. This is who it’s all about. The Weird Fish shoal choose us because we offer something different from the norm. A sense of fun, an eye for practicality and plenty of style and quality. Don’t be surprised if you bump into them on a hike across the moors, out walking the dog, flinging a frisbee with the kids on the beach, or just having a chat down the local. They do things the Weird Fish way! We pride ourselves on the provenance and quality of our clothing, and work closely with our trusted suppliers to ensure our factories adhere to our strict rules, such as no child labour, and excellent working conditions. We are always looking for cleaner and greener processes. For more information read our ethical policy. We live for that Friday feeling. Whether we're unwinding by the coast, walking our dogs, or just catching up with friends at the local, the weekend gives us the time to unwind and be ourselves. We believe everyday should be full of the freedom and fun that the weekend gives us. This belief is lovingly stitched into every Weird Fish product. Everyone has an old, trusty favourite in their wardrobe. You know the one we’re talking about; the well-loved jeans or ‘washed 100 times’ T-Shirt that puts you in a good mood the moment you put it on. When Saturday morning rolls around and it’s time to escape the daily grind we just want to kick back in our feel-good favourites and enjoy the good times. Every piece of our clothing starts with that feeling in mind because we deserve this sort of comfort every day. In 1993 we discovered a great airbrushing technique to create our first T-Shirt. Over 25 years later our funny Artist T-Shirts are still as popular as ever. While most fish were still swimming away from ‘the Net’ we thought it was about time to get ourselves online. The Weird and Wonderful Tour hit the road, visiting our favourite and slightly more out of the ordinary festivals with great show offers, competitions and giveaways. We created an exclusive range of funny, bird inspired Artist T-Shirts to launch our partnership with the wildlife charity RSPB. With profits going directly to the charity. Using a neglected collection of knitting machines, we crafted a unique, slow-spun, triple-twist fabric, that looks like its’ namesake. This was the year our iconic Weird Fish Macaroni™ was born. We opened our first Weird Fish shop! We now have 15 Weird Fish shops dotted around the UK so be sure to visit your nearest one! The year our Macaroni™ turned 20. Our designers are constantly evolving our exclusive, iconic fabric so you can enjoy new additions each season. To celebrate our 25th year we had a little makeover and refreshed our logo, still keeping our famous fish bones of course.